Software-driven animation. 146-hour year-long cycle (never repeats). 1. You must have the latest version of Flash Player to access animations on the next page. Click below to access the animation. Mesocosm (Northumberland, UK) is an algorithmic work, representing the passage of time on the moors of Northeast England. One hour of world time elapses in each minute of screen time, so that one year lasts 146 hours. No cycle is identical to the last, as the appearance and behavior of the human and non-human characters, as well as changes in the weather, are determined by a code using a simple probability equation: seasons unfold, days pass, moons rise and set, animals come and go, around a centrally located and almost omnipresent human figure. The man with his back to us is based on Lucian Freud’s painting of Leigh Bowery, the performance artist, designer, and drag queen whose larger than life personality helped to catalyze the interdisciplinary experimental art scene in London in the 1980s. 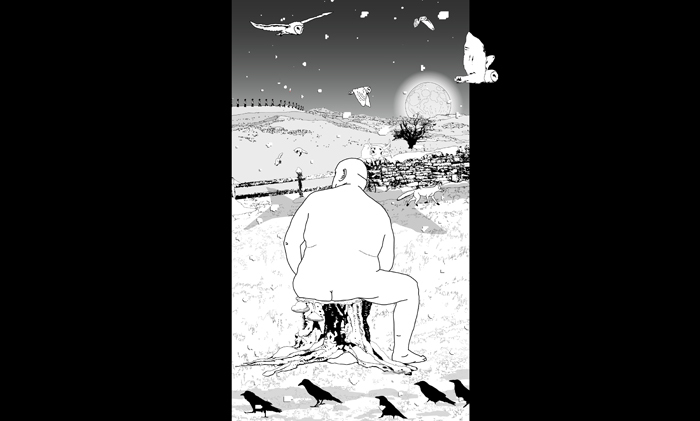 In Mesocosm (Northumberland, UK), he acts as a Green Man, a corpulent bridge to the world beside the human: his nighttime excursions outside the edges of the landscape imply action beyond the wings of the constructed theatrical landscape, while by day he permits various small creatures not only to climb on him but also to feed on him, producing the only specks of color—blood red—in the work. Mesocosm’s figures suggest an open, even infinite, set of beings and phenomena, unconstrained by taxonomic limits: there are cows, owls, ravens, squirrels, foxes, humans and humans in animal costumes, butterflies, refugees, bats, dumpsters, steamrollers, vans, dogs, hares, fairies, dragonflies, inchworms, spiders, hikers, bikes, swallows, smokestacks, fog, pollen, shadows, garbage, leaves, petals, snow, rain, sleet, and wind. Though the relaxed rhythms and spacious temporality of Mesocosm make it seem, on the surface, anything but explosive, its rendition of the human umwelt is founded on a sense of species life as volatile, capricious, random, and unpredictable. An expanded view of what constitutes ‘nature’ is revealed in this staging of the endless communicative events and interactions that shape the experience of human and other animals. (Adapted from a text by Una Chaudhuri). Mesocosm is a series of animated landscapes that develop and change over time in response to software-driven data inputs. The title Mesocosm is drawn from the field of environmental science and refers to experimental, simulated ecosystems that “allow for manipulation of the physical environment… [for] organismal, community, and ecological research1 .” Mesocosm’s animated landscapes portray specific places populated by animals, people, plants and weather whose behaviors and interactions are driven by data, probability, and if/then conditions, which determine what appears on screen. They are drawn by hand, frame-by-frame, yet their choreographies are dynamic – not looped or canned - dictated by constraints in real-time. Each of the works in Mesocosm is long in duration and recombines perpetually as inputs determine order, density, and interrelationships. They are looped, and have no beginning or end. Because change happens slowly, but can be radical over time, the works are intended to be seen in public places where people gather or pass through frequently, or lived with like a painting – in living rooms and meeting spaces.